Our summertime Mongolia tours features the remarkable scenery of the Khan Khentii and Asralt mountain ranges, one of the world’s last large wildernesses. The Khan Khentii includes a Strictly Protected Area over a peak worshiped by Mongolians. We travel by Mongolian ox-cart through a spectacular valley, picturesque place of high cliffs on the Baruun Bayan River to visit The Princess Temple. Experience the feelings of peace and tranquility that leisurely traveling by ox-cart in the wild. Starting from Ulaanbaatar to Terelj National Park. Terelj NP has beautiful scenery high rocks specific landscape. 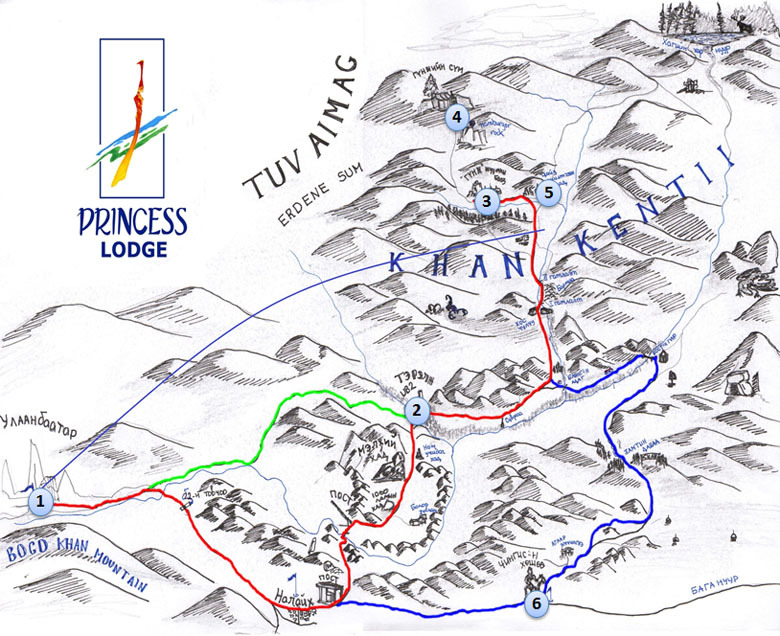 Arrival at Princess Lodge and relax in national Ger located in the beautiful Khan Khentii Mountain range. After lunch horse riding trip. After breakfast riding to Princess Temple ruins with the guide in the nearby forest and enjoy the scenery and views from top of the mountains. Field coffee break and back to lodge. Lunch at the Lodge. Sauna and shower time. After breakfast drive to nomadic family. Learn their daily life and how do they live, breeding horses. Taste milk products. Free time hiking and relaxing near the Lodge. After Breakfast ride back to the Baruun Bayan limit. Lunch will be served as a picnic on the way. At the beginning point there is car will be waiting, then drive to Tsonjin Boldogt and sight with Great Chinggis Khaan Statue in the valley. Or we will directly drive to UB passing by Terelj.